It's that time of the year again for my husband's birthday. Another excuse to experiment with one of the listed cake recipes in my to-bake list. 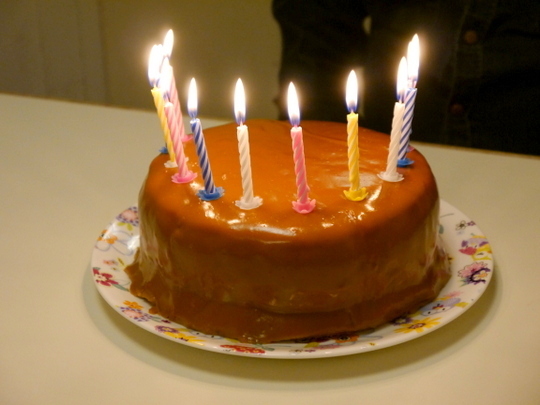 I chose a caramel cake because I know my husband's fond of caramel. 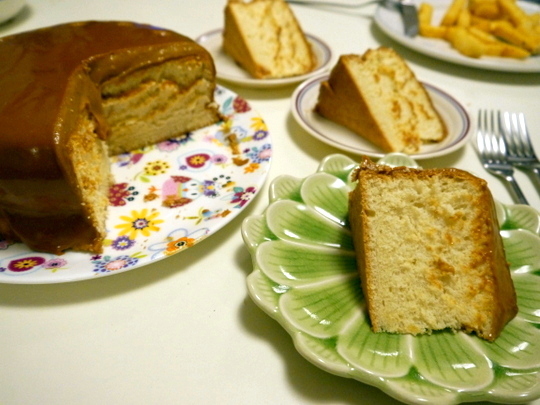 So Corinne's wonderful looking Filipino-style caramel cake recipe gets taken out. It is essentially an airy chiffon cake with a pourable icing. The cake was good although I would have liked the caramel icing to be a little bit sweeter so I adjusted the recipe. And be very careful in caramelizing the sugar. 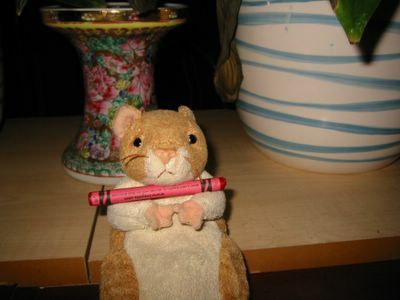 I found out it burns very easily after it starts turning brown. Also, I didn't bother with cutting the cake in half horizontally and ice the middle. I thought there was not enough icing to spread around. This step is marked optional because our cake was just fine as it is. Line the bottom of an ungreased 20cm/8-inch round 3-inch high pan. In a large bowl, beat the egg whites and cream of tartar on high speed until frothy. Add in half of the sugar (6 Tbsp) gradually while beating until stiff peaks form. In another bowl, combine the cake flour, baking powder, salt and the rest of the white sugar. Mix well. Add in the egg yolks, water and vanilla. Beat with electric mixer or by hand until smooth and well blended. Bake for about 50 minutes or until top springs back when lightly touched or a skewer poked in the middle comes out clean. Invert pan into wire rack immediately and cool completely. To release cake from pan, carefully run a thin knife around sides of pan and invert cake onto a large serving plate. [Optional] Cut the cake in half horizontally. Invert the top half onto a cake plate and spread a little icing on it. Top it with the other cake half cut side down. Pour the rest of the icing on the cake spreading evenly on top and the sides. **Tip: For easier handling, wrap your cake very well in cling film, then refrigerate overnight before frosting. Whisk the egg yolks with 2 Tbsp of the sugar in a small bowl/jug. Add in 1/4 cup of the evaporated milk and all of the cornstarch. Mix well and set aside. In a heavy saucepan, over low to medium heat, carefully caramelize the remaining (1/4 cup) sugar. When sugar is completely melted and a golden brown colour, add boiling water (careful it will splatter). Bring back to a boil while stirring ocassionally making sure all the caramel well mixed into the water. Gradually add in the rest of the evaporated milk (1 1/4 cups) while stirring. Heat mixture just until it starts to boil. Without turning off the heat, pour a little of the caramel mixture into the egg yolk mixture while constantly stirring to temper the eggs. Mix until smooth. Pour this back into the remaining caramel mixture in the saucepan. Mix until icing reaches a thick consistency. Remove from the fire and then add in the butter and vanilla extract. Let cool just a little bit, whisking once in while. The mixture will thicken more as it cools. Pour onto cake while still warm. Note: This icing is pourable. Let it flow smoothly over the top and sides of the cake. Put strips of baking paper under your cake to catch the drips.